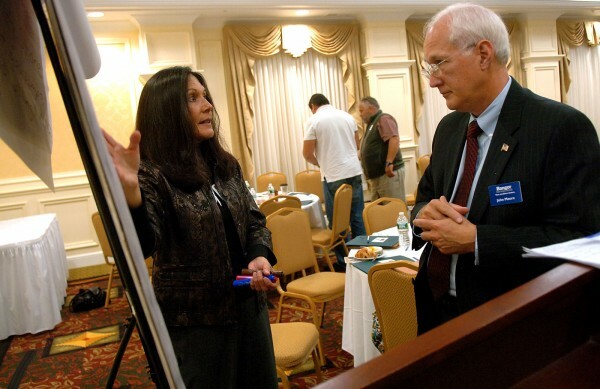 Susan Hammond (left) of Four Directions Development Corp., discusses economic growth strategies with John Moore of Bangor Savings Bank during a forum at the Hilton Garden Inn in Bangor in this September 2011 file photo. Do you favor a bond issue to provide $4,000,000 in funds to insure portions of loans to small businesses to spur investment and innovation and to provide $8,000,000 in funds to make flexible loans to small businesses to create jobs, revitalize downtowns and strengthen the rural economy? Maine has few resources to use to promote economic development. Loan guarantees and revolving loan programs targeted at small businesses are among those tools. The $12 million sought in Question 3 would recapitalize two such programs run by the Finance Authority of Maine: The authority’s Commercial Loan Insurance and Regional Economic Development Revolving Loan programs. FAME has been in the news lately for its involvement with Cate Street Capital and Great Northern Paper Co., owners of closed mills in Millinocket and East Millinocket. So, it is important to note that the programs that would be funded from the bond in Question 3 are for small businesses, not big ventures such as paper mills. The Regional Economic Development Revolving Loan Program, the beneficiary of the $8 million bond, is “a small taxpayer investment that leverages a lot of capital,” said John Moore, senior vice president of community development banking at Bangor Savings Bank, Maine’s largest community bank. The program has leveraged an additional $16 in financing for each $1 loaned out. Loans of up to $300,000 can be made to companies with fewer than 50 employees in a specific set of industries, which were recently expanded to include tourism and downtown businesses. The money flows through regional economic development entities such as Eastern Maine Development Corp., Washington-Hancock Community Agency and the Greater Portland Council of Governments. Since the program was started in 1993, it has helped 772 Maine businesses expand, with more than 6,000 jobs created and nearly 4,500 sustained, according to Mainers for Small Business, the group advocating for these bonds. The default rate for these loans is about 9 percent, much higher than conventional loans, but in line with these types of more risky loans, the group said. In addition to financing, the program provides technical assistance to borrowers, such as workforce training and help accessing federal contracts. This can be more important than the loan funds. The smaller portion of the bond, $4 million, would go to commercial loan guarantees, which encourage banks to lend to small businesses by insuring part of the loan. The average loan insured through the program is $108,000. These loans need to conform to bank underwriting standards, so they are not more risky than conventional bank loans. Instead, they supplement what a bank can lend based on a borrower’s collateral or bank lending limits. FAME estimates the $4 million for commercial loan guarantees would leverage $68 million in additional lending and help create or retain more than 1,500 jobs. Question 3 is a small investment in helping small business start and grow in Maine. It deserves voter support.